Chris was born on 29 August 1959 in Sarnia to parents Roger and Eleanor Hadfield, and grew up on a farm. He first became interested in flying when he watched the Apollo 11 moon landing. As a member of the Royal Canadian Air Cadets, he earned his glider pilot license, earned a flying scholarship and attended the Royal Roads Military College (two years) and the Royal Military College (two years) after secondary school. Chris Hadfield has several firsts to his credit. He was the first Canadian to fly as a mission specialist (aboard STS-74 in November of 1995), and the first and only Canadian to visit the Soviet Mir space station on this same mission. In April of 2001, he flew again on STS-100 and helped to install Canadarm 2 during two space walks. In May of 2010 Hadfield served as the Commander of the NEEMO 14 mission aboard the Aquarius Underwater Laboratory, living and working underwater for fourteen days. He flew aboard the Soviet Soyuz TMA-07M in December, 2012, and joined Expedition 34 on the International Space Station, and became Commander of the ISS as part of Expedition 35, during which time he helped to run dozens of scientific experiments dealing with the impact of low gravity on human biology. Chris became the first to play the station's guitar and compose a song (Space Oddity). He retired shortly after the mission ended in May of 2013. He had attained the rank of Commander and CSA & NASA Colonel. He also received numerous awards, including appointment to the Order of Ontario in 1996 and the Order of Canada in in 2014, receipt of the Vanier Award in 2001, NASA Exceptional Service Medal in 2002, the Queen's Jubilee Medal in 2002. He is also the only Canadian to have received both a military and civilian Meritorious Service Cross (2001 and 2013, respectively). 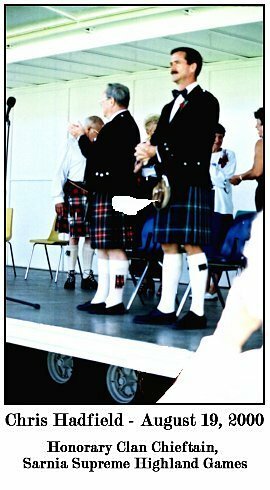 While he was between missions, Chris was invited to be an Honorary Chieftain at the 2000 Sarnia Supreme Highland Games in August. 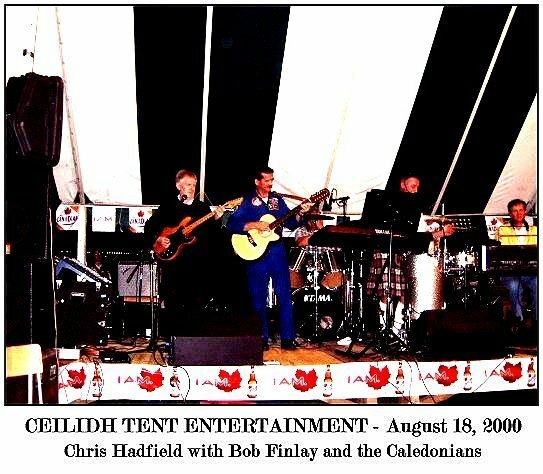 On the day prior to the opening ceremonies he grabbed his guitar and joined The Caledonians in the Ceilidh Tent for a performance. During the Opening Ceremonies, Chris recalled his views of Earth from the ISS and the peaceful sensations of weightlessness and relaxation during periods of sleep.